to give myself a chance to surprise myself. * I just finished my most important race of the year and I needed a break. * I was sick for 3 weeks before the race. We all know how I feel about this one. And since it was my birthday week(end), there was no way I was going to miss out on anything that sounded even remotely fun. Like a track workout on Tuesday, or a century ride on Wednesday, or 7 miles on Friday morning to make it 33. (I turned 33 on Saturday, the day of the marathon.) I know it wasn't smart. But I didn't care about smart. All I care about these days is fun. My kind of fun, that is. You may or may not agree. When people ask if I have any more races coming up, the answer is: No. Just some fun events! The good news about telling my awesome Coaches, Heath and Mahogani, the day after the 70.3 World Champs that I was going to be doing my own thing until at least December was that there was absolutely no pressure. I don't really feel pressure in running races anyway but this time nobody had any expectations. And it felt so good. working hard can be fun too! 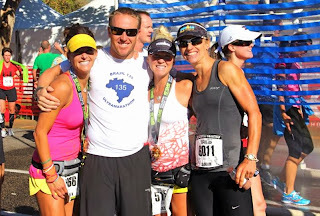 Last year I ran the first 20 miles with my good friend, Colleen, and then had a total blast the last 6 miles. We started out very conservatively and took our sweet time. It was a great experience. The perfect way to run my first open marathon and I left knowing I would be back. This year I wanted to see what I could do considering my (lack of) physical preparation. I was hoping I could be mentally strong enough to push hard anyway. I wasn't afraid. Inexperience was definitely a bonus as I didn't know what to expect and how badly it was going to hurt. (As opposed to triathlons where I know exactly how much I will be suffering and sometimes I don't want to go there...) Either way I was going to finish. Walk or run. I told Karl that I wanted to run under 3:40. (Last year was 3:49, I think.) Ideally, I would break 3:30. If things went extremely well, maybe I could come in at 3:20. That's all I was able to predict. I simply started out at a pace I thought I would be able to hold for 4 hours. That's it. I had a watch but I didn't look at it. There was also a clock at each mile marker but I didn't bother doing the math. I didn't care. I ran with the 3:20 group for a bit but the pacer was driving me crazy. So I went on ahead figuring they would pass me eventually. I took two potty breaks. ** I talked to some good-looking triathlete who, at mile 6, after we had been running next to each other for a while, said something along the lines of: Hey. You and me. All the way to the finish. That is usually my pick-up line when I try to get some random person to pull me along but I let him have it. 20 miles is a long way to go still. Turns out he ran a 3:08 last year and I started laughing thinking there was no way I was running it that fast! Things were dandy and at mile 13.1 the clock said 1:37:04. Even this math genius was able to figure out that if I kept up some sort of decent pace I should definitely finish under 3:30. Sweet! It was light and sunny by now and the scenery is absolutely gorgeous. I was very happy and grateful to be healthy and fortunate enough to run quite far on my 33rd birthday! Not something I take for granted. 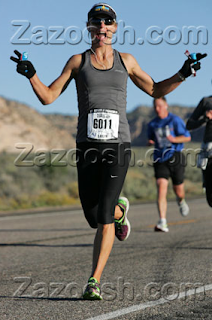 At mile 18, I consciously looked at the clock again and it something like: 2:12. Ok, let's see. More math. 8 miles to go. I can run 8 miles in an hour. Maybe even 8.2 miles in an hour. Maybe even 8.2 miles in 58 minutes??? Holy crap! There is a slight chance I can sneak in under 3:20! Let's go for it!!! 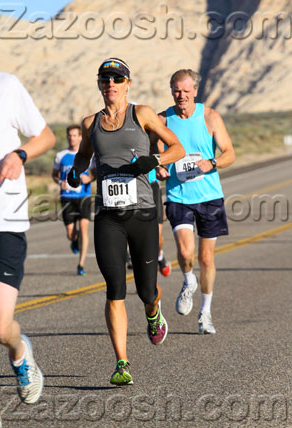 Of course, the minute I decide to really race the next 8 miles, I hit a low. Go figure! I made it through the next 2 miles telling myself that everyone hits a low at some point and if I don't actually make it in 3:20, who cares? Shortly after I was feeling better again, the wheels started to come off. 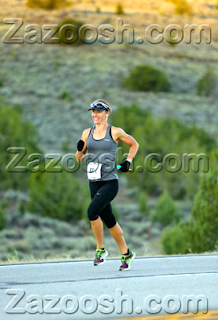 Around mile 22. But, hey, I can do anything for 4 miles! Or so I tell myself. It was painful and I was afraid my legs would give out under me any minute but I was still having fun. I was loving it! And I was totally going for it. No holding back. This was going to be my birthday present for myself and I was determined to make it a good one! 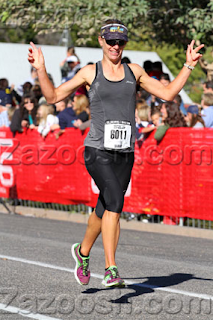 The finish line didn't seem to actually get any closer and when I finally crossed it, the clock said: 3:10:32. YES!!! But NO! How the heck was I not able to run 30 seconds faster to actually make it under 3:10? Ugh! I was elated and a tiny bit crushed at the same time. 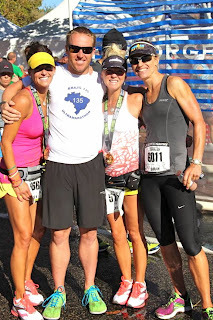 When I ran into my friend, Debbie, who is the coolest girl ever and managed to run the whole darn thing in 2:53, I was just super excited for her, for me, for all of us! Then Coachie came and told me I ran 3:09. Really? YES! How could I forget? Of course chip time is faster than clock time. D'UH! It was great to see so many friends having great races and to hang out for a bit afterwards. A huge shout-out to Jess who ran a marathon at 22 weeks pregnant in an astonishing 3:15. That lady rocks! Yes, she is the one in the above picture who doesn't even look pregnant! It was also fantastic to hang out with Josie from Flagstaff. She invited me to stay with her in her hotel room Friday night. It was so nice not to have to camp pre-race on what ended up to be a super windy and cold night. The boys braved it like the studs they are but I was happy to sleep in a comfy hotel bed! And we all got to play in the pool and hot tub afterwards. Thanks, Josie! Josie and I post-race. We were freezing. Who knew that I could run 26.2 miles at a 7:12 pace? I certainly didn't! While I wasn't quite able to be as brave as I had hoped in Vegas, I was brave enough this time and did, indeed, surprise myself. It's certainly easier when there are no expectations and it isn't the race you have been training for for months but I hope I have learned something in the process and can apply it in my next triathlon! Here is to being brave!!! **It's one thing to pee in your pants during a triathlon when you are wet anyway and you keep pouring water over yourself. I wasn't particularly interested to have pee in my pants, socks, shoes this time around. 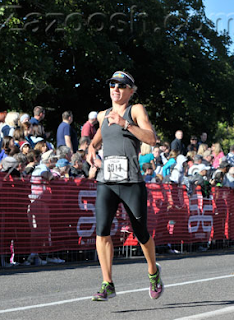 Somehow it seems gross in a running race but not in a triathlon. Weird. Well, I guess it's gross either way but in a triathlon I just care about fast, not gross. Here I figured a couple of minutes weren't going to break or make anything. Plus, it was cold. This is late, but big congrats Sarah! I've had a handful of races like this and it is SO amazing! You ran such an incredible time and have inspired me to be brave and see what I can do at a marathon next month. Good job!